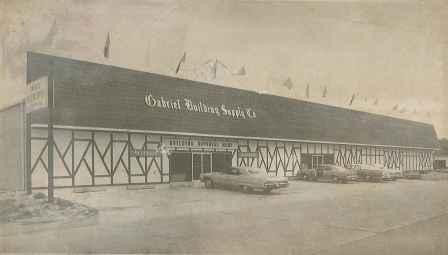 Gabriel Building Supply Company was founded in 1926 by Harry Joseph Gabriel Sr. as a lumber and millwork supplier, as well as a door and window manufacturer. After returning from Tulane University, Harry Joseph Gabriel Jr. joined his father in running the family business. Incorporated in 1960, Gabriel Building Supply Co., Inc. was born. The most common lumber species sold at that time was the Tidewater Red Cypress that was harvested from the swamps south of Ponchatoula. In 1973, Robert “Bob” Gabriel joined his father, and with a newly remodeled store, began to cater to the “Do It Yourself” market as well as expanding its residential contractor base. The business continued to grow and in the 1982, Bob’s brother Harry James Gabriel joined the team. With the vision that the business would continue to grow, the Gabriel’s purchased an 11-acre tract of land on Pine Street with the hopes of expanding yet again from their 8th street location. That dream came true in 1992 when the company moved into its new state of the art building supply center, now able to fully service the residential contractors and Do It Yourself retail segment. Gabriel Building Supply is still in this same location today, and expansions of the facility have occurred over the years. 2008 and 2009 brought about change yet again. With the passing of Harry Joe Gabriel Jr., and with Harry James Gabriel wanting to spend more time with his travels and humanitarian missions, Bob took over sole ownership of the company. In July of 2013 a second location opened in Amite, Louisiana to better serve the northern end of Tangipahoa and neighboring parishes. The Amite location also has a full service lumberyard, along with electrical, hardware, paint, plumbing and other departments. We pride ourselves on providing the best customer service while maintaining competitive pricing to our customers. Along with Bob are his daughters, Jasmin and Devin, and a knowledgeable, dedicated staff to provide our customers with the exceptional service they are accustomed to, for years to come.